Despite the negative headlines, there are reasons to be optimistic about the future of the construction industry. Conditions are ripe for proactive contractors to build a competitive advantage. To navigate the obstacles ahead, companies should review and develop their business strategy around five key areas. The first priority is to develop a deep understanding of the fundamental drivers of profitability across the business. They should then focus on operational excellence and commercial effectiveness to create a robust organisational and financial position that will facilitate further investment. Once these aspects have been addressed, companies can build competitive advantage through innovation and pursue profitable growth. Despite the negative headlines, there are plenty of reasons to be positive about the future of the construction industry. Areas of the market are expected to remain strong, and conditions are ripe for proactive contractors to create a competitive advantage against traditionally minded peers. That is not to say that the sector is without its challenges. Its historically conservative approach to innovation has led to a fiercely competitive market and low profit margins, resulting in a vicious circle of underinvestment. Furthermore, high-profile company collapses and macroeconomic uncertainty continue to cast a shadow over the industry’s prospects. In this Executive Insights, L.E.K. Consulting explores the opportunities for U.K. construction companies and explains how they can navigate the obstacles ahead while stealing a march on their competitors, by first ensuring that the foundations of their businesses are solid. As the U.K. negotiates its exit from the European Union and approaches the low point of the construction cycle, the outlook for the next few years is especially difficult to forecast. The majority of economists are predicting low economic growth of 1.5-2% a year over the next few years, and there is significant uncertainty about the short-term outcomes as Brexit approaches and rising interest rates force businesses and households to cut expenses. While the construction market expanded by 5.2% a year between 2014 and 2017, growth is expected to average only 1.2% a year until 2020, according to Experian1. Public spending — an important source of business for the sector — stands at 40% of GDP, but with the U.K. government’s tightening fiscal policy, further cuts are expected. Construction businesses also face significant problems from within the sector. Hesitancy to invest in innovation has resulted in a lack of differentiation within the market and has exacerbated margin pressures (see Figure 1). New market entrants easily overcome low barriers to entry and present an appealing proposition to buyers focused on cutting prices and imposing stringent terms and conditions, suppressing prices and increasing project risk profiles. In turn, low margins make it difficult to attract money to invest in innovation, IT and human capital. The result is a vicious circle of underinvestment, as businesses struggle to find sources of competitive advantage in a sector that continues to lag behind others in its use of digital technology. Meanwhile, attracting talent remains difficult. 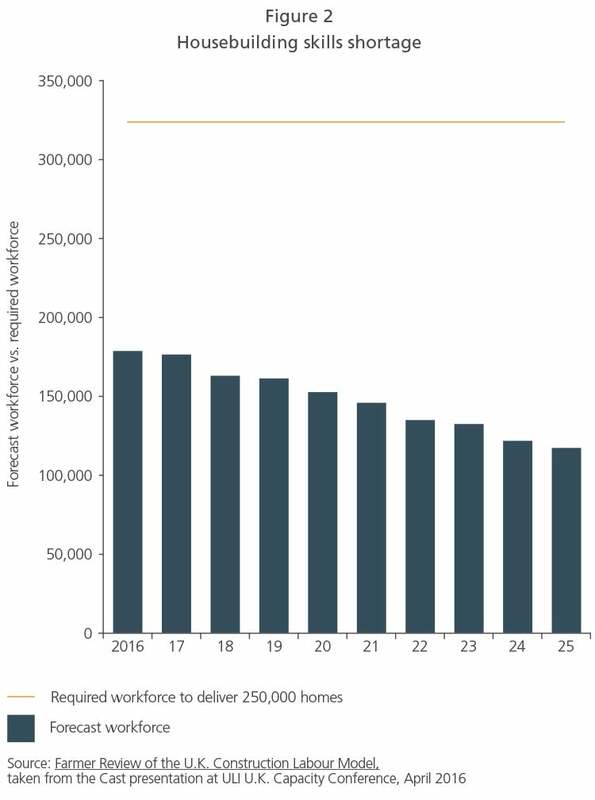 Workforce numbers are significantly below the levels required to fulfil current housebuilding projects and are forecast to shrink further over the next seven years (see Figure 2)2, even before accounting for the full potential impact of Brexit on migrant labour. The increased emphasis on academic skills and university education in the U.K. has resulted in construction being a less desirable career choice for younger generations, and events such as last year’s collapse of Carillion (the U.K.’s largest ever trading liquidation) have further damaged the construction industry’s image. Despite the challenges facing the sector, there are reasons to be optimistic about the construction industry, and several areas of the market are expected to remain buoyant. Infrastructure expenditure, for example, will continue to grow at a rate of 8% a year until 2020, according to Experian, and large-scale projects that have already been contracted are unlikely to be cancelled. Examples of government-backed schemes currently under way or in the pipeline include the Hinkley Point C nuclear reactors in Somerset, the HS2 rail link, the Thames Tideway sewer project and the Great North Rail Project. Growth in residential construction is also expected to continue, averaging a rate of 4% a year, and government announcements, such as the recent £2 billion of extra funding for affordable housing, suggest a continuing commitment to building programmes. Furthermore, growth in spending on repairs and maintenance is expected to be steady at 2% a year across most end sectors, with greater resilience to economic instability than new build. To navigate the years ahead, businesses in the construction sector should review and develop their business strategy around five key areas. First, they must develop a deep understanding of the fundamental drivers of profitability across the business. Then, they should focus on operational excellence and commercial effectiveness to create a robust organisational and financial position that will facilitate future investment. 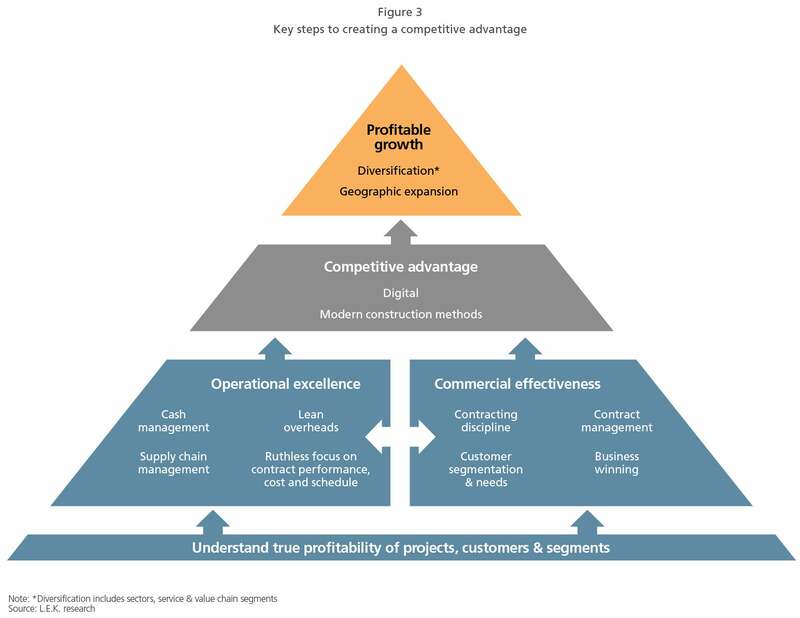 Only once these aspects have been addressed should companies take the next steps towards building competitive advantage through innovation and seeking profitable growth (see Figure 3). 1. Understand true profitability. It is essential for businesses to understand their sources of profit and loss, a fundamental requirement that is regularly overlooked. This requires a detailed assessment of profitability by customer, segment, project/contract type, business unit and so on, in order to diagnose the issues that lead to poor performance and cost overrun and, critically, identify where best practice exists. 2. Establish operational excellence. Businesses should maintain a relentless focus on project cost, schedule and performance, manage cost and understand risk in their supply chain, and regularly monitor the cost and capability of central functions to ensure they are sufficient to support the evolving size and shape of the organisation, while remaining as lean as possible. They should also establish KPIs and metrics that give management visibility into business performance and provide employees with clear accountability and incentives to manage contracts effectively. Perhaps most important of all, companies should understand the capabilities of the people within their organisation to ensure that the right teams are deployed to the right contracts, maximising efficiency and minimising delivery risk across the project portfolio. 3. Build commercial effectiveness. Contractors must also take the time to tune up the commercial effectiveness of their business. Building a deep understanding of different customer segments and their needs is critical, a process that often requires a degree of focus to strengthen customer relationships in core sectors. Those that employ effective business development programmes to ensure sufficient flow of projects into the pipeline will find themselves at a distinct advantage, able to select and bid for projects out of choice rather than necessity. When bidding, a detailed understanding of risk is key to ensure projects are priced appropriately. Successful players need to take a tough yet professional line with customers during the course of contracts to avoid scope creep and transfer of risk without appropriate commercial returns. Achieving both operational excellence and commercial effectiveness requires access to the right data and market insight. By joining up internal and external data sets — e.g. linking project/invoice-level details with market information — businesses can streamline their processes and open up powerful insights into areas of good and bad performance (see Case Study 1). 4. Build a true source of competitive advantage through innovation. The next step for contractors seeking greater profitability is to invest in innovation. This will enable them to differentiate their offering, provide value-added services and create intangible value that traditionally minded peers cannot replicate, thus improving their business proposition and overall market position. Digital initiatives such as Building Information Modelling and Management (BIMM) — an intelligent 3D model-based process used by the majority of larger contractors — can be utilised more widely to optimise operations and delivery. Similarly, other advanced modelling tools (such as the 3D geological modelling tool created by Mott MacDonald and Software House) open up opportunities to more accurately communicate ground conditions and risks to project teams, as well as to standardise and modularise designs. Contractors should also consider exploring more innovative construction methods that offer the potential for greater quality and productivity. Mace, for example, has reduced its delivery times by 25% and its waste by 75% with the help of its “jumping factories” — steel-framed enclosures that climb up a building as the structure and facade are built inside. These “factories” have also reduced the risks associated with working at height and in adverse weather conditions, helping to increase the overall productivity of Mace’s workforce. 5. Search for further pockets of profitable growth. With the security and confidence provided by an operationally excellent and commercially effective business that is differentiated in its market, contractors can diversify through market and customer segments, products and services, or through geographic expansion, to uncover potentially untapped areas of profitable growth. However, diversification must be approached with caution, and contractors will only reap the benefits once the right foundations have been laid. The construction sector remains challenging for contractors and investors, but with pockets of the market expected to remain strong, there are reasons for optimism in the years ahead. Contractors that act now can build efficiency and competitive advantage to position themselves for further profitable growth. L.E.K. was retained by a large U.K.-based construction company to advise on a number of broad-ranging strategic issues. With improving quality of earnings as the primary goal, L.E.K. reviewed the business’s performance from several perspectives, using detailed contract-level profitability analysis to identify factors that explained the significant volatility in profit outcomes. L.E.K. also conducted an assessment of organisational effectiveness and overheads, as well as a qualitative review of the business’s processes and procedures, to establish recommended best practices and to ascertain root causes of poor project performance. This analysis was placed in the context of the construction market in each of the segments the company served, linking internal data with external market perspectives to provide management with fresh insights. As is true in almost all complex businesses, this analysis highlighted that there was no silver bullet to resolve performance issues. Instead, the client was provided with a clear understanding of its market position in different subsectors and regions, its current performance, and the capabilities required to win. This highlighted a range of practical improvement initiatives, including enhancements to its people, processes, systems and operating model, which would help to increase overall profits. How Can Western Cement Majors Ensure They Remain Relevant in Asia?